DPI collaborates with Australian Pork Limited (peak industry body), Pork Cooperative Research Centre and NSW Farmers Pork Committee to maintain and grow a viable and sustainable pork industry. DPI has research officers located at Elizabeth Macarthur Agricultural Institute in Camden working closely with the pig industry on animal biosecurity, disease and control and strategies to reduce the potential development of antimicrobial resistance. DPI Animal Biosecurity, in collaboration with Local Land Services (LLS), manage the risk of significant animal biosecurity threats to protect the economy, community and environment of NSW. DPI's Agricultural Land Use Planning team provides advice to industry, local government and Department of Planning & Environment about agricultural planning and development matters. 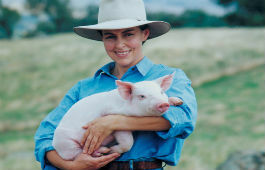 NSW DPI Agriculture Intensive Livestock Industries group has a Development Officer Pigs based at Tamworth Agricultural Institute available for general industry inquiries. Contact Jayce Morgan (Phone (02) 6763 1257 or jayce.morgan@dpi.nsw.gov.au). View the financial, health and wellbeing resources and services available. From 1 February 2018, new NLIS arrangements for the identification and traceability of pigs came into effect nationally.